On the main access road opposite the Prince of Wales Hotel, the Waterton Visitor Centre (403/859-5133, 9 a.m. to 8 p.m. daily June to Aug., 9 a.m. to 5 p.m. daily May and early Sept., closed the rest of the year) provides general information on the park, sells fishing licenses, and issues Wilderness Use Permits. 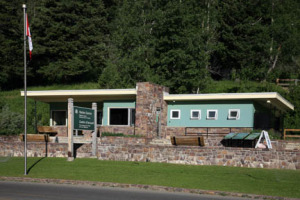 The park’s administration office on Mount View Road (403/859-2224, 8 a.m. to 4 p.m. weekdays year-round) offers the same services as the visitors center. For more information on the park, write to Superintendent, Waterton Lakes National Park, Waterton Park, AB T0K 2M0. The Parks Canada website is www.pc.gc.ca. For general tourist information, the local chamber of commerce website, www.mywaterton.com, provides plenty of current information and links to accommodations. Tamarack Outdoor Outfitters (Mount View Rd., 403/859-2378, 8 a.m. to 8 p.m. daily) has a section devoted to books, with field and recreation guides dominating. The Waterton Natural History Association, based in the Waterton Heritage Centre (117 Waterton Ave., 403/859-2624, 10 a.m. to 5 p.m. daily May to Sept., 10 a.m. to 8 p.m. daily July and Aug.), stocks every book ever written about the park, as well as many titles pertaining to western Canada in general. The numerous tourist-oriented gift shops along Waterton Avenue are worth browsing through when the weather isn’t cooperating. Tamarack Outdoor Outfitters (Mount View Rd., 403/859-2378, 8 a.m. to 8 p.m. daily) is a five-generation family business that stocks a little of everything. Here you’ll find a good range of outdoor clothing and equipment, fishing tackle, books, a currency exchange, and picnic supplies. Waterton has no banks, but travelers checks are accepted at most businesses, and ATMs are scattered throughout town. The post office is beside the fire station on Fountain Avenue. A laundry on Windflower Avenue is open 8 a.m. to 10 p.m. daily. The closest hospitals are in Cardston (403/653-4411) and Pincher Creek (403/627-3333). The park’s 24-hour emergency number is 403/859-2636. For the RCMP, call 403/859-2244.